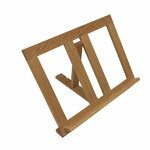 Sagaform cookbook holder is a must for every food enthusiast. Were you interested in cooking or baking this object keeps your cookbooks in shape and tidy. Sagaform offers popular Swedish design for kitchen and home. Brighten up your everyday life with their functional and fun-filled products for the kitchen and home bar. Are you looking for that perfect hostess gift or a house-warming present? Sagaform products are guaranteed to bring a smile to the reciever’s face. Established in 1988, Sagaform works with the foremost designers in Sweden and has gained well-deserved popularity around Europe.